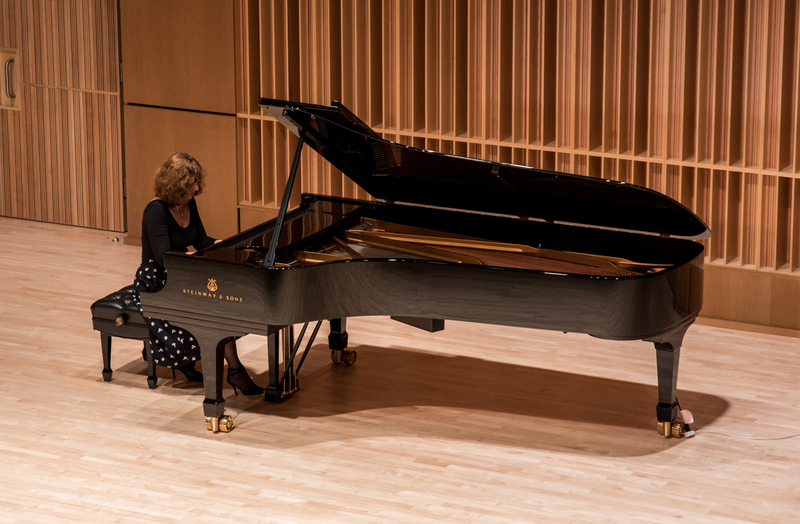 Once again, piano students performed one of their final recitals as undergraduate students in the Piano Fellowship Recital in the Addicott/Joshi Performance Hall on March 8. The piano fellowships offer piano students the opportunity to pursue their master’s degrees in music performance or composition. The fellowships are supported by The Martin Foundation, Inc. The recital offers the students one more chance to perform at IU South Bend. The Martin family has endowed the piano fellowship scholarship. These talented students then present a concert to highlight their best work, according to Ketevan Badridze, who is the senior lecturer in piano. This year, it the fellowship program was under the direction of Tanya Gabrielian, Martin Endowed Chair of Piano and Professor of Practice, and Badridze. Piano students prepared for this recital since the beginning of the spring semester. Since students performed in front of an audience and nerves could be factor, Badridze gave priority to helping students conquer anxiety. Both Badridze and Gabrielian added several group practices before the concert. Students took time out of their hectic schedules to perform for this concert. “We maximized their chance to be on stage because for piano performance, they needed to perform well, up to their talents. It’s basically business as usual, we just prepared them to learn some serious pieces. We also focused on choosing special pieces for this recital to make it more entertaining,” Badridze says. Students involved with Piano Fellowship Recital played pieces by both recognizable composers as well as contemporary composers. Dylan Engquist Bajo performed “Clair de Lune” by Claude Debussy. Taylor Lyles performed “Sonata in G major K. 283” by Wolfgang Amadeus Mozart and “Widmung” by Robert Schumann/ Franz Liszt. Gretchen Wedertz performed a selection of preludes from Claude Debussy. Joo Hee Jeong performed “Colorful Clouds Chasing the Moon” by JianZhong Wang and “Suite De Danzas Criollas” by Alberto Ginastera. Yeheng Liang performed “Paganini Variations for Two Pianos” by Witold Lutoslawski.